First of all, why are aliens always blowing up New York? I mean, the city is awesome but still... Anyway, Avengers was amazing! I really enjoyed myself. Though I love comic books, I hadn't read any involving The Avengers so I have no idea if the movie was faithful to the comic. Marvel must've learned from the X-Men: Last Stand disaster so I doubt they'd deviated from the original, at least not by much. 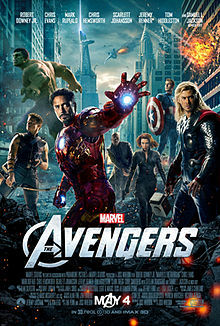 The Avengers is like a sequel but different. More like Iron Man 1 and 2, The Incredible Hulk, Thor and Captain America were prologues. I love this idea. The characters were all played by the same actors from their personal movies, for the most part. The guy who played Hulk in this one isn't the man who played him in The Incredible Hulk. Since I didn't see The Incredible Hulk, I can't compare to the two actors but I do wonder why they didn't bring back Edward Norton. Speaking of which, it helps to have seen the characters' personal movies or, at the very least, be familiar with the stories. As I said, I didn't see The Incredible Hulk nor did I see Thor but I didn't have a problem following The Avengers because I was familiar enough with the Hulk and Thor. Also, I've never been a huge Hulk fan but I so enjoyed him in this movie. He was awesome! Didn't expect that. I left the theater smiling. I'm still smiling just thinking about it. It was so action-packed with a good story and witty dialogue. The movie had some laugh out loud moments. I didn't expect that either but loved it. The characters were all so fun. I even liked the villain. Excellent character development. Though they were all like mega super-heroes, the story never focused on one more than the other. Nothing was overdone. I can't think of anything about The Avengers I didn't like. The special effects were amazing. It had some good 3D moments. I'm not saying you should shell out the extra bucks but I don't regret doing it. If anything, the 3D previews more than made up for the extra money I spent on this ticket. Looks like another Marvel vs. DC summer with The Avengers, The Amazing Spider-Man and The Dark Knight Rises. Marvel won last summer but this year, I don't know. The Dark Knight Rises looks like it could crush Marvel's movies. This will be another interesting summer, movie-wise. Looking forward to it! The last one, Prometheus, is not Marvel or DC related but I had to share it. *Sigh* comic book heroes, Sci-fi and epicness. BTW, they're making another Expendables. Looks like fun. I don't usually go for these kinds of movies, but this one I will have to go see. It's getting great reviews.